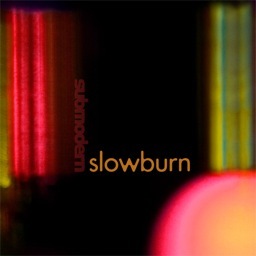 The slowburn blog was started to chronicle the recording and mixing of Submodern’s latest record slowburn. The music for this album was originally written to be played at the Burning Man festival in 2005, when we were offered a couple slots to play at the Center Camp Cafe but asked to bring something without drum beats. We took our existing songs and completely re-worked them, putting them into the sequencers of a couple of Nord Modulars which were paired with Kurzweil KSP-8 effects processors. The two of us each sat at a Nord Modular, and had the ability to bring melodic loops in and out of the mix, select individual sub-sequences with variations on the melodies, as well as control the sonic parameters of each sound. The result was a sixty to ninety minute set consisting of these slower (92bpm) melodic loops, which were mixed and matched together to form a single, intertwining ambient mix of live electronic music. To record the album, we added back in some beats but stuck with the same sequenced loops and slower speed. All the synthesizer sounds were made and sequenced with the original Nord Modulars, and the beats were recorded from the internal sequencers of vintage drum machines such as the Roland TR-808, TR-909 and TR-606. A variety of hardware and software effects were also used to supplement the Kurzweils. The end result is an album that is somewhere between our free-flowing live set and a proper studio recording, a sixty minute continuous mix of ambient-electronic with beats where the songs bleed into each other, and alternately drift off into corners or shoot off into space. We hope you enjoy the album, as well as the chronicling of its recording process on this blog.